Screams are for more than roller coasters? Step right up and face your fears, as the scariest Town of Terror has just arrived on the Gulf Coast. 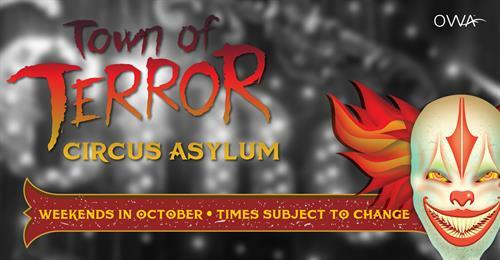 This year?s Town of Terror theme is none other than the Circus Asylum. They came, they performed? and they never left. These forgotten acts have become possessed and taken over the Town of Terror. The ringmaster is ready to welcome you to his Circus Asylum and claim you as his own? Fridays and Saturdays from 6-11pm and Sundays 6-9pm during the month of October? with an additional Halloween opening on October 31 from 6-10pm! This collection of chills and thrills are sure to scare you, as you navigate your way through possessed performers, come face to face with fear, and become hypnotized by the circus of your nightmares. Will you find your way out or will you get lost in this Town of Terror? If you make it out alive, brave the streets of Downtown OWA and weave your way through the Town of Terror acts who didn?t make the cut into the circus? These rejects have created quite the terrifying performance and you are the main event. Join us each weekend in October in Downtown OWA (outside of the ticketed haunted house or gated amusement park), for free frights, as you brave your way through Curtain Chaos, Caged and Confused, Gypsy's Den of the Departed, Freaks and Fears and The Ring of Death. Will you survive this ? fear fair? or will you become part of the Circus Asylum forever? !